is www.handmadesword.com a reputable company? QUESTION: hi, is www.handmadesword.com a reputable company? they have some awsome stuff but i am scared to get ripped off, and what do you think about tozando? also shinwa is made by masahiro, i have one (emperor) I bought for $85 us from bud k (first sword i bought before i found you guys at sbg), its 1060 mono, cuts well, super sharp. well balanced. very sturdy. sorry no footage yet. just a pic. thanks. 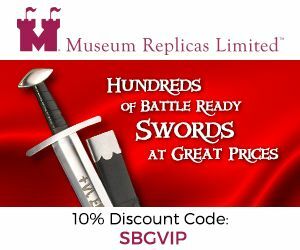 Comments for is www.handmadesword.com a reputable company? hey just a thought for a quick fix , you could use a chopstick for the peg. just cut it to length then bam! now your cooking! thanks for the reply! I have done business with Handmadesword.com and I am happy with my purchase thus far. Though the sword that I bought was only several hundred dollars, and you get what you pay for, it is a lovely sword and quite sharp. 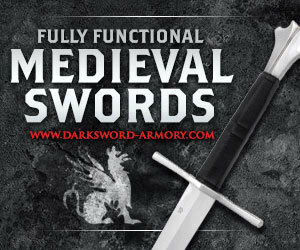 It does have all the flaws you would expect from a sword in this price range, but since I am not planning on getting in a duel with anything tougher then a bottle or mat, I am not too worried. Final Verdict- A good enough sword for a fair enough price. Good looking and sharp, but don't expect perfection. I made a purchase from them about 5 months ago and I'm completely satisfied. I got a combo set which contained a katana, wakizashi, sword stand, decorative box, and cleaning kit for $180. My katana and wakizashi are both made of damascus steel and have artistic tsubas. My only complaint is that it didn't come with directions on how to clean the swords or what the different cleaning kit parts were. I was a little confused at first but eventually I figured out that they had posted instructions on the site. It completely exceeded my expectations and I couldn't ask for anything better. I'd recommend this to anybody who wants a sword that is high quality yet doesn't leave you broke. A buddy of mine bought one of thier 100 dollar katanas. Out of the box....very nice. Then came the cutting tests. This thing had the sharpness of a butter knife. There are many other brands out there that are a better value for your money. Mekugi should be made from bamboo. Find a Kendo club in your area and ask them if they have a broken Shinai(bamboo practice sword) you can have. Cut the Mekugi so that it tapers. You should have Mekugi to last many lifetimes. Don't use chopsticks if you value your life and those around you. Even if you don't use the sword you never know when an annoying guest or family member might pick it up and give it a swing. I recently bought a katana from handmadeswords.com and I thought that it was made kind of sloppy. For $100 I felt like I was being ripped off . The mekugi were crooked and bulging out of the handle and the temper line was fake (wire brushed on) and only tempered all the way on one side. Also the blade was only slightly sharp and even had a dull spot towards the top. and this sword was supposed to be 'battle ready', suitable for cutting etc.. as described. It is ridiculous what someone must pay to get a decent sword , and yes $100 is alot for a piece of steel in a wooden handle. Thats right I said it. I love collecting weapons and especially swords but the pricing is out of hand. I've seen assault rifles that are cheaper, and I have seen swords that are the same price as a car ! and thats not right.. Its just greed. plain and simple. 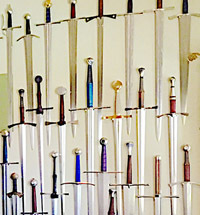 And yes there is some time and effort into making these swords, including materials, but it still doesn't add up to hundreds or thousands of dollars. Anyway I have made my point. In my opinion handmadeswords.com is a shady company. Oh, and they have a 30 day money back guarantee if you are not satisfied with the product, but when I contacted them about returning mine they wanted me to email them clear photos of the problems. what weasels. Never had a problem with their swords. Customer service was never an issue with them. Excellent communication; fast delivery service. Very honest people. It may not be the real deal but the quality is pretty awesome. Masahiro bamboo katanas are decent; good quality sword. You're better off buying the $150.00 and up katanas if you're on a budget. Their 1095's are the best in their catalogue. Most I have purchased are 1095/clay tempered steel. They'll run you between $300 and $600 depending on style. Why spend so much money when you can get a better deal with them? Well, the tachi gunto is pretty much way over and I wouldn't go for that. Why don't you guys ask them? I bet they're willing to answer your questions. I purchased a katana from handmadesword.com (http://www.handmadesword.com/294l.html) and it is mediocre at best. At the time I bought it, I only wanted a sword to display that wasn't a piece of stainless garbage. It fits the role perfectly. It's shiny, it's sharp (properly sharpened), and it's 1045 carbon steel. However, A few months after buying the sword, I felt the urge that every Sword owner has: to go into the backyard and slay some pool noodles. The sword was able to cut the evil pool noodles with relative ease, and that was that. HOWEVER, after the battle, I decided to take apart the sword: "pop the hood" so to speak. After removing both mekugi, and properly removing the tsuka, what should I find but a BENT TANG! Not like a slightly crooked tang compared to the blade, but the last inch was bent at a 15 degree angle. Lovely. After this revelation, I reassembled the katana, and left it on the stand. Also, when I took it apart again, there was absolutely NO friction fit on the tsuka to the tang. It was so bad the once the mekugi were out, simply turning the sword at an angle will cause the tsuka to fall off. At best, these swords are best for LIGHT cutting. 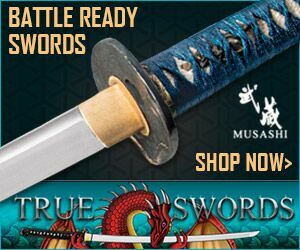 With everything else out there, there are SO much better alternatives (ex: musashi swords offer a san-Mai forged folded and clay tempered katana for the same price of one of the "clay temper" blades handmadesword offers. One cool thing however is that handmadeswords recreates hanwei's Kami katana perfectly, right down to the double habaki. Of course, the blade itself is monosteel 1045 high carbon, but hey, you get what you pay for. Purchased a number of katana from them in the lower price range and they seem fine. I have seen katana made from other companies and you get what you pay for. The 1060 carbon steel blade is fine and is balanced well. The wrappings are leather in my case and look good, the bambo pegs are the same as any other and the handle is solid. Customer service is excellent and they contact you for every question you have. Got my (Handmade swords.com) katana "The last Samurai loyalty".Its perfections to my eyes.I unsheath the blade..traditionaly...and found no scratches on the habaki or the blade.Its mirror polish blade makes it look nice to look at.This katana not going see any action,strictly for my collection. Just a word on prices as a reaction to anon who feels that a samurai sword is a piece of metal in a wooden handle and should be fantastic in every way for 100 dollars. This type of opinion can only come from somebody who has no concept of quality and what is takes to produce it. Even if you consider a medium skill laborer who you would pay $30/hour for (thats alot lower than Plumber prices BTW), this would only be about 3 hours of work. I don't believe that any one person could produce a samurai sword in 3 hours. This does not even include the cost of the materials. By the way, a samurai sword is not a piece of metal in a wooden handle. 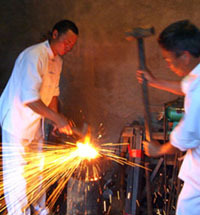 It is a blade: steel formed or cut to a shape, then sharpened and polished and drilled. Have you ever been in a shop that is capable of doing these operations? The 'handle' is wood wrapped and fastened and then specially wrapped with chord tightly and properly (don't think a machine is doing this, buddy). The guard has to be formed and finished. Then you have the sheath which could take a long time to make by itself- softwood, hardwood, fitting the sword, matching halves together, finished with chord, and laquered. And yes, a samurai sword does include a sheath- it is a package. This doesn't even address what goes into making the furniture! There is alot to such a sword. Maybe $100 is alot to you, but it seems pretty cheap to me for such a product. Now, if you can recommend a different product that is even better and even cheaper, I would find that useful. I looked at reviews of swords for several months. I was really nevous at first. I finally bought one for a good price, plus, it came with a 20 percent off discount. It was real fast shipment, only a week. Really, it depends on which sword you get. You should look at the specificatons first. 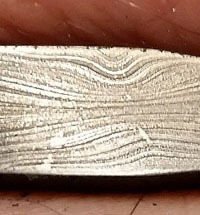 Look at the edge sharpness,blade material, and make sure you can see the hamon (tempered line) in the photos. It is all there if you scroll down a little. And on most swords, you can watch a video of the sword and it's detail. I purchased an Iaito Katana/Wak combo for about $200 from handmadesword.com as my very first sword, intending to use it regularly for practice. As far as iaitos go, I'm sure I could do better. While the blade is sturdy enough, the hi works properly and the sword feels good overall (and is apparently well-balanced, according to my sensei). However, I've had some problems with it; the hamon is, of course, not real (unsurprising, since the blade is the usual zinc-aluminum alloy that most iaitos are made from), but it's also really unattractive. Wire-brushed, extremely regular and painfully fake-looking. It could have done with an acid-etch job to at least blend it with the metal around it. Worse, it's slowly worn away at the edge with my Iaido practice. The Katana's saya was loose on arrival, I had to install a shim to make the fit snug enough to hold upside-down without it falling out. The ito loosened quickly, and I had to do a full rewrap (by hand, which is positively arthritic) to get it to a tightness that could withstand practice. The fittings were tight enough at first, but upon disassembling the sword, it appears that the blade was cut down fairly roughly to form at least some of the tang; they probably use one blade size for all of their iaitos and cut them to fit various fittings and tsukas. All of the fitting were glued in place, including the tsuka. The tang under the habaki had a chunk taken out of it that actually still concerns me, though the iaito seems to be sturdy for now. I'm shopping for a replacement as we speak, although I do use it in regular Iaido practice without much issue. I disassembled the Wak too; I have similar criticisms about it, specifically the glue and an even messier tang (the tang appears to have been a katana-sized blade that was cut down to size) with cut and grind marks all over the tang and a chunk taken out under the habaki. This tang actually made me leery about its structural integrity, and I have not reassembled the Wak yet. I might never do so, considering my sword stand has only two levels; I'll probably place my new iaito there when I select it. There is no signature on either of the tangs; indeed, the tangs look nothing like the pictures on the site. They are very rough, a little dirty and unpolished. Perhaps I simply got a bad pair of swords, but to have the same criticisms for both swords implies that this may not be an isolated case. Do I recommend them? Yes, but only if you are very careful. I have not dealt with their customer service, so I can't comment on that. This place has swords for the cheap collector if you are interested in getting a real sword and not paying a fortune for it get a WWII oficers sword made at the tokyo armory this sword is guaranteed to be real. E-Bay has them for $150-$600 and they will not fall apart when you cut some thing the one i have was made in 1939 and will go through a 2in tree branch with ease..
"If it aint broke, dont fix it" !!!!!! I purchased 1045 Last Samurai Katana from this company. Sword is pretty good quality. Nice weight and full tang blade. Also tsuba is exact replica of the movie not like musashi replica (musashi tsuba has nothing to do with the movie sword) . Prices may be little bit higher than other sites but you get what you paid for nothing more nothing less. 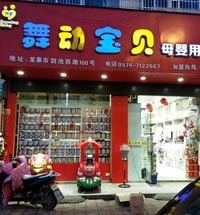 I must mention service and delivery is very good they ship mostly the same day. My opinion very trustable company. Note: Totally i purchased 3 products, delivery was always very very quick. Shipping is free and fast so it makes even with the prices. I recently purchased #308, the cloud wave katana and the smoke tsuba from Handmadesword.com. i picked up my box and upon opening, i went over my katana with a fine tooth comb, so to say. i am AMAZED with how AWESOME it is. 1095 clay temped, with a FANTASTIC Hamon, which is one of the main reasons i bought it in the first place. ive trained with katana for a few years, and the blade is one of the sharpest ive ever seen and all the fittings are super tight. BEAUTIFUL case, and stand, the maintenance kit is great, and over all i'm more than pleased. the customer service was very cooperative and fast to respond to both emails and phone calls. i highly recomend handmadsword.com to everyone and i will def buy again. if you would like pics or more info, feel free to comment. They stand by their products, customer service is top notch as well as product quality. Descriptions are accurate and staff is extremely polite and helpful. Handmadesword.com have spoiled me, their delivery times are lightning fast, prices are spot on for the quality, and the costumer service is epic. I've bought 150 swords from them, (I have a small online sword-shop), and I have had 1 complaint, and that was scratches on a blade. Had to document the damage before sending it back but I took less than two weeks from I delivered it here in Norway until I could pick up my new sword. They may not stock epic-quality swords like ColdSteel or handcrafted real Nipponese katanas, but they have a great selection at fair prices, and there not much more one could ask. i am malaysian. dealing with handmadesword where i ordered sword from them. once order is confirmed and my credit card is debited e mail i received informing that the order is cancelled. regretly when i seek remedy of that transaction until now is no avail. i lost almost usd 1600. please help me getting back my money from this shwred company. Took less time to deliver than expected every time I ordered. I Ordered from them at least 15 times already. 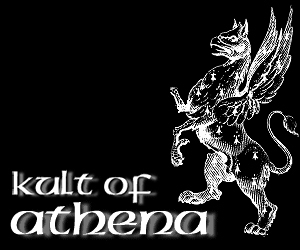 I am an experienced iaido student and have purchased several of the swords from this site and can say with great confidence that these swords are of the highest quality i have managed to find for less than $500. and on top of very good quality when one of the swords (during regular disassembling) the hand guard broke i sent the company an email and they sent me a replacement sword (even though they could have just sent the guard.) i cannot recommend this site any more. understanding of all aspects of the artform. I will repost what I find. My comparison for this purchase is going to be my first and currently only other katana which is a CAS Hanwei Practical Special. It bent cutting through 4"s of loosely rolled up carpet, pretty weak if you ask me. Just a tip for those whose swords are warping. Hi, I immigrated from Sapporo when I was young and brought my swords with me. Just to give you a comparison my sword is definitely more high end then anything they sell on handmadeswords but I do not practice cutting with my sword. I highly recommend getting a cheap sword to practice your tameshigiri. Its the art of giri or cutting and any and ALL swords will bend if your technique is wrong. My sword will bend or wrap as well if my cutting technique isn't straight. I bought a katana from HMS for about $800 about a year ago, and have practiced with it everyday. I love it. I have own several different katanas.. musashi, hanwei and wall hangers.. and this is by far my favorite. I cut with it all the time and have never had a problem, or felt unsure of the blade at any point. I highly recommend it, and will definitely be getting another. 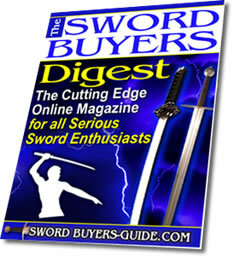 Shipping was fast and the sword fittings were nice, but the blade had much to be desired on the #392. It had an uneven scratchy finish. It came sharp but I found the blade to be very soft for 1060 steel. I tried it on a plastic mouth wash bottle filled with water, and the blade edge mushroomed at the point of impact. Now one could argue that my swing was bad, but I never had that happen with my 1045 Musashi. It just made me sick since it doesn’t even make a good wall hanger now. I have bought two swords from handmade sword and I am impressed with both of them. I see a lot of the negative comments here are from people who thought they were spending $100 on a $1000 sword. Seriously, let's take a step back and ask yourself again what you expected. The first I bought was in the $200 range and the second was in the $500 range and I could not be happier with both FOR WHAT I PAID. If I were to match either one of them up with a real nipponese blade I would no doubt cry but since I am not a millionaire I'll settle for something that is functionally efficient and economically sound. I have never had a problem. Swords are as described. Fast shipping and good deals. I recently purchased a WWII Officer's Gunto Sword from Handmadesword.com in functional green. I was a little leery of spending $1,300 on a sword that I'd never seen person but I feel that it was worth the money. The crafsmanship seems very good and the sword is exactly the way that it was described. My understanding is that it is made in China, the steel is folded but power-hammered vs. hand-hammered and it was clay tempered to produce the hamon. The sword fits very snugly in the saya and there is no rattling, overall fit and finish is very nice. I am no expert and this is my first Japanese style sword but it appears to be good quality. 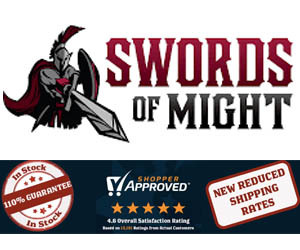 I had a tough time finding any review on this sword prior to my purchase so I hope that this is helpful. I recently bought #741 as a Christmas gift. It came faster than expected and in really good packaging. I've never used the blade to cut with, but the sword felt solid and the wood was of good quality. I know you're skeptical about pricing; however, unless you're actively practicing cutting things with it, I think this does just fine. The blades' sharpness is explained on each particular blade. The one I bought was sharp, and for my purposes this was just fine. I had good dealings with this company. I started training in Iaido this January and after doing some research, purchased #982 (Iaito - Aluminum Blade for $149) The order was fulfilled very quickly and the packaging was very sturdy. 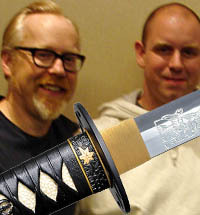 Unfortunately, when I removed the sword from the saya, it felt as if I was holding a plastic toy. I decided to practice with it anyway (as I live next door to the dojo) and ended up nicking the blade in two places. I sent an email to HMS explaining my disappointment with the sword as well as the fact that I had damaged it. Within one hour, I had an email apologizing for my disappointment, a shipping label to download and return the sword, and an offer to go on their site and pick out a replacement. I opted for the slightly more expensive 207L (katana - 1045 steel.) They shipped the new sword for free and did not charge me another penny. I absolutely love the replacement sword. Well-balanced, well made, and beautiful in appearance. The saya is not the best quality but good enough!! I posted a very positive review on their site about the 207L as well as a negative (one star) review about the 982. I was pleased to see that they posted BOTH verbatim. I have dealt with this company. I dropped $400 - $500 on a katana and tanto. The katana is a nice sword. It's light and well-balanced. Beautiful saya. I have not cut with it. I s'pose I could do tameshigiri during battojutsu sometime. I'd expect the sword's performance to be completely average. But that's what I expect for $300. I'd do business with handmadeswords.com again. Hope this helps. Reputable, yes!! High Quality? Not Really. I have several HMS , Musashi, DK, and Hanwei Swords. The HMS handle very well, but I find that the Musashi Fittings and blades at the same carbon Level are better and cheaper. HMS stands for their product, they have fast shipping and give you lot of options ready to ship. The Hamon on the 1045 line is pretty much stencil acid etched. In the end they feel like copies. Hanwei and Dragon King are on another level completely.